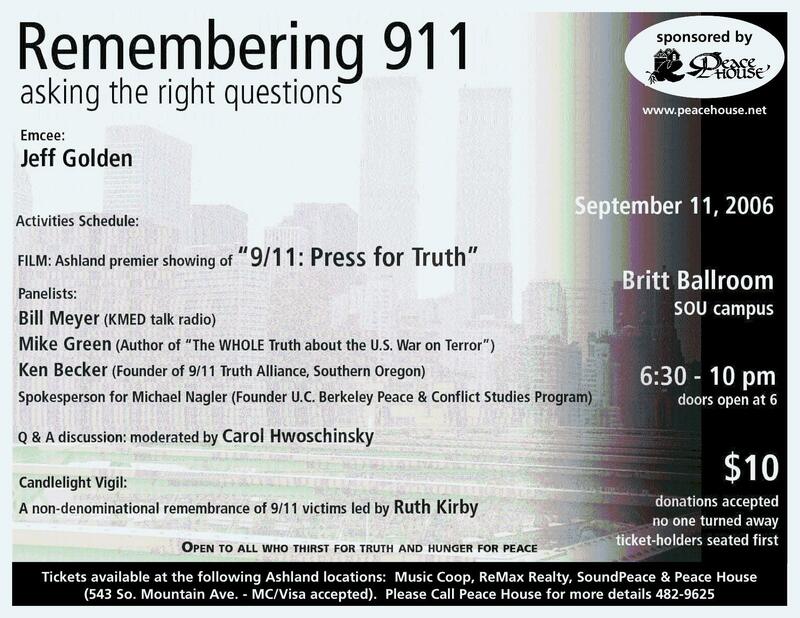 On the evening of 9/11 hundreds will gather at the Britt Ballroom on the campus of Southern Oregon University in Ashland, Oregon at 6:30 p.m. to mark the 5th anniversary of the coordinated attacks on this nation and ask questions that continue to remain unanswered. The event is open to all media and sponsored by Peace House, an Ashland-based nonprofit center that serves as a local resource for education and a model of non-violent communication. With an emphasis on reconciliation between conflicting groups and individuals, Peace House explores ways in which people can live cooperatively with one another while participating in social change for peace and justice. Mike Green: Author of “The WHOLE Truth About the U.S. War on Terror: answers to every question you never knew to ask” and the Content Editor at the Ashland Daily Tidings. Michael Nagler representative: Spokesperson for Nagler, founder of the U.C. Berkeley Peace & Conflict Studies program. Candlelight Vigil: Rev. Ruth Kirby of Living Truth Center will lead the vigil. Tickets are available at the following locations in Ashland, OR: Peace House (543 So. Mountain Ave. - MC/Visa accepted), Music Coop (181 A. St, Ashland), ReMax Realty (320 E. Main St., Ashland), SoundPeace (199 E. Main St) and at the door. Ticket holders seated first.